It’s been ages I haven’t made soup for myself, I’ve had no desire for soups whatsoever. Maybe with winter coming this way and cooler weather, this will change. Simple traditional minestrone is delicious, hearty, filled with vegetables, colors, etc… but as any dish, it can be modified a bit switching some ingredients and give it a little modern twist. Some people might wonder why I used the provencal pistou instead of the Italian (Genovese) pesto since minestrone is originally from Italy. Pistou and pesto are probably related since Provence region and Genoa are not too far from each other, besides the ingredients are similar (but not the same!). 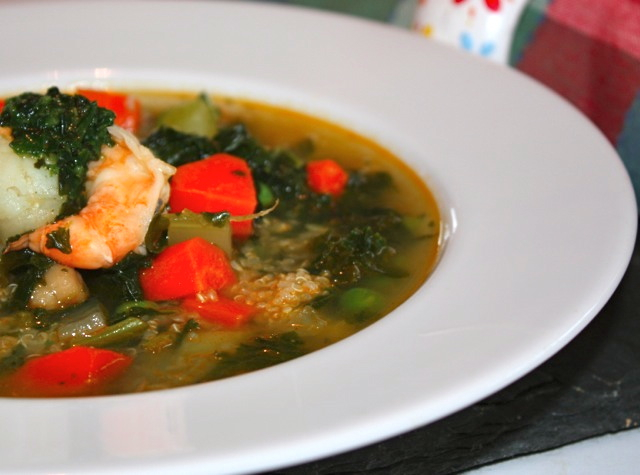 In France we have la soupe au pistou, a very famous soup from Provence made with lots of vegetables, that could be a relative of the Italian minestrone. Now let’s not argue on which one came first. In this recipe, I decided to use a pistou whose ingredients are basil, garlic and olive oil instead of a pesto which has those three ingredients in addition to pine nuts and parmesan cheese because of the shrimps. I have been taught by my mom to never use cheese with fish or seafood, so here I am, still following her strict rules. If you decide not to use shrimps, then a basic pesto will work fine….and if you want to use a traditional pesto to go with the shrimps, do so. My kitchen is not a dictatorship kind of regime! It’s just an idea box…so are you pistou or a pesto? I substituted pasta with quinoa, but you could also use farro, wheat, barley, etc…I love the little grains of the quinoa, they keep me light for the day. In a large pan, heat olive oil, then add onion and soften. Add all the diced vegetables, quinoa crushed garlic. Cover with water and let cook until all the vegetables are soft, about 45 minutes. In the meantime, saute shrimps in a pan. 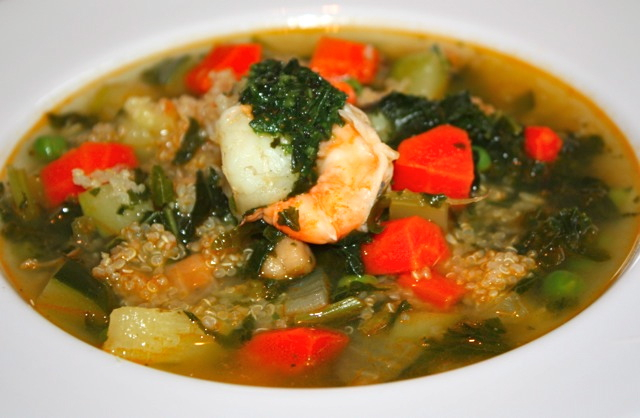 Serve minestrone in bowls, divide shrimps on each bowl, and add one tbs of pistou on top. Stir and enjoy. In a mortar crush garlic and salt until it turns into a cream, then add basil and keep crushing. Add oil progressively to obtain a smooth paste. This entry was posted by silvia on December 15, 2013 at 5:00 am, and is filed under Soups. Follow any responses to this post through RSS 2.0.You can leave a response or trackback from your own site.